Returning to the vibrant land of color was a re-awaking process like I’ve never experienced before. It all started when I deplaned in Christchurch, New Zealand. 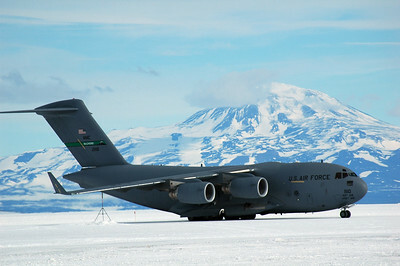 I had stepped onto a massive C-17 Globemaster III military transport aircraft in the stillness of McMurdo Sound on the Antarctic coast and off it into a foreign world of warmth, darkness, sweet aromas and a light spattering of rain. Knowing it would be warm when I arrived, I wore shorts under the heavy Antarctic clothing. Peeling off the layers as soon as I was on the tarmac waiting for the shuttle bus to the terminal felt glorious. The warm moist air enveloped me, light drops of rain tingled my skin and my sense of smell felt keener than ever. Even darkness took on a new fascination. The stars, having been hidden from me by 24 hours of sunlight a day at the pole, were partially obscured by scattered clouds and the light pollution of the city, but they were more beautiful than I could have imagined. It was approaching midnight but I was totally wired with all these sensory stimulations that had lain dormant since I flew south three months ago, all the way south. I flew back with four of the ten Polie GA’s and about a dozen scientists. The rest either stayed for the winter (a decision they made while at the pole) or were redeploying at a later date. We had a 24-hour layover at McMurdo Station where some of us took advantage of the wait to explore. The South Pole terrain is flat and barren while Ross Island has fun things like hills and mountains. That evening three of us climbed Observation Hill for a bird’s eye view of the station and the surrounding area. Then the next morning before our flight to Christchurch, Tony and I took a nice long hike out to impressive Castle Rock. Once in Christchurch, we spent a few days getting ourselves organized and settled back into the real world. I picked up the camping gear Mom shipped down to me (thanks Mom!) and sent some packages of things home that I wouldn’t need for my upcoming adventures. My plan was to get right on the trail. I had 18 days to get as much as possible in before flying to Australia to help guide a trip in the outback. Derek, a fellow Polie GA, was looking forward to doing some tramping in New Zealand as well so he joined me for the rigorous itinerary I had planned. We flew from Christchurch to Queenstown, found a hostel, bought food for three days on the trail and caught a shuttle first thing in the morning to the start of the Routeburn Track. The Routeburn Track is one of New Zealand’s “Great Walks” and it cost each of us NZD 40 a night to stay in the “hut.” That was nearly double what we paid to stay at the hostel in town and NZD 10 to stay in the campground the next night. We got lucky as usually the great walks require several weeks advance booking. But we were on the trail the same day and not ten meters into the hike we crossed a small span bridge over the most beautiful sparkling and glowing light blue water that I’ve ever seen. Surrounded by a frame of dazzling white rocks and deep green lush forest and dark blue skies, I knew we were in for a spectacular hike. That night we stayed in the Routeburn Falls Hut. Um… excuse me… more like “luxury lodge.” While we did have to do our own cooking, the hut featured a dozen gas stoves built into a long counter with sinks and running water and a dining room with a tremendous view of the deep intimate valley below and the steep and grandiose mountains thrusting themselves skyward. A small patch of snow still lay tucked in a guarded pocket which turned cotton candy pink in the alpenglow of the light from the setting sun. Day two put us over through a pass crossing the Serpentine Mountains. A short side hike to the summit of Conical Hill (1515m) opened a view of the glacier-covered Darren Mountains forming the next ridge over across the Hollyford Valley. Looking north we could see Martins Bay, the west coast of the South Island. The trail from the pass traversed down the steep western slope until we hit a ravine, perpendicular to our line of travel, in which the shimmering turquoise Lake Mackenzie and our campground was tucked. After a refreshing afternoon dip and a good night’s sleep, we finished this hike, descending through the beech forest of the lower elevations to a junction on the road to the popular Milford Sound called The Divide. We stuck out our thumbs and the first car passing by picked us up. Patrick, our Swiss driver was on a six-month cycling tour of New Zealand and had opted to rent a car for a bit to take a break from traveling under his own power. He dropped us off in the town of Te Anau where after picking up some supplies and waiting out a few days of bad flying weather, we hopped on a float plane and flew into Suppers Cove of Dusky Sound, part of an ornate system of fiords protruding from the ocean into the lush rainforests of Fiordland National Park. The park covers the southwestern corner of New Zealand’s South Island. Not having a dock to pull up next to in this remote corner of wilderness, we had to get our feet wet to get from the plane to the shore and our boots remained soaked for the rest of the week. We could rely on one thing for certain: each day offered unique challenges and each day offered plenty of mud and standing water to slog through. While hiking, the sandflies weren’t so bad, but while standing still those pesky nibblers would pile up on any exposed flesh, especially the back of the hands. The saving grace from them in the evening after hiking were the huts, and the huts were actually huts, costing a mere NZD 5 a night – no reservations needed. This hike ranks as one of my absolute favorites for the remoteness, diversity and amazing scenery. On the third day, we hiked up and out of the thick rain forest and into the exposed alpine zone where we could see the dramatic terrain we had been walking through. From the top of the trail at Centre Pass, I dropped my pack and continued to climb up to the summit of Mt. Memphis (1405m) to extend the view even further. From here it was two more days of tramping through the rainforest before we came out at Lake Manapouri where we had to take a ferry back to town. From here, the plan was to head down to Stewart Island just off the south coast of the South Island. We had wanted to do a ten-day hike along the coast around the circumference of the north part of the island, but with the two-day weather delay in Te Anau and the fact that Derek bummed his knee on the Dusky Track we just took it easy and strolled through the sanctuary on the smaller nearby Ulva Island where rats and opossums have been eradicated so the bird population can thrive like it did before these non-indigenous pests were introduced to New Zealand. Our shuttle driver, Craig with “Scenic Shuttles” who drove us down from Te Anau, told us it was cheaper to fly stand-by from Invercargill to Stewart Island than to pay for a lift to the wharf and take the ferry across. So, we flew back to the South Island, caught another shuttle up to Dunedin along the east coast, chilled there for a few days then rented a van with a gal named Lucy from England, who is looking at moving to NZ, and car camped through the Catlands on our way back down to Invercargill. Derek and I then flew back to Christchurch where we parted ways. He was heading off to Bali then on to Cambodia and around the world heading westward. I was popping down to Melbourne to join my friend Carl in leading a bunch of Year 11 school kids on a week-long trek through the Australian Outback. We drove over 1000 km to get past the town of Broken Hill and started our walk. It can get so hot out there that conventional water bottles will let the water get too hot to drink, so special eight liter evaporation cooling bags are carried by hand. We slept out in the desert under an unobstructed sky, lulled to sleep by the gentle twinkling of the southern stars and awoke before sunrise to the waning moon to start walking while the air was still cool. The kids did great, and while some of them admitted hiking and camping isn’t for them, it was a major accomplishment and a first time experience that will continue to enrich their lives. This entry is filed under: Air, Antarctica, Australia, Blog, Snow.